Lionel Messi talks about the FIFA World Cup -video satellite /FTP. Switzerland, May 2014: Argentinian football player Lionel Messi gives an exclusive interview to the Actua PR team one month before the FIFA World Cup in Brazil kicks-off and just days ahead of Barcelona’s crucial La Liga match against Atletico Madrid. Messi, a four-time winner of the “Golden Ball” award for the best footballer of the year speaks about the race to win the Spanish league title and how much this would mean to the former Barca coach Tito Vilanova, who died earlier this year. The 26-year old also talks about his national team’s chance of taking its first World Cup since 1986 at the upcoming World Cup in Brazil. Actua PR will provide rights-free footage of Lionel Messi’s interview and his visit to the Audemars Piguet manufacturing centre. 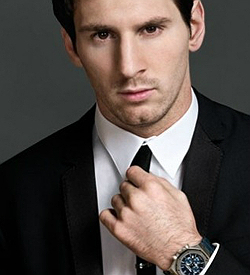 During his short visit to Switzerland, Messi also talks family and his love of watchmaking. VNR will be available on Tuesday 13th May, 2014 at 1400GMT.